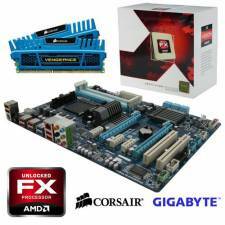 AMD FX QUAD Core 3.8GHz, 8GB DDR3 Gigabyte ATX Motherboard Bundle Upgrade Kit. Our range of Motherboard Bundles are ideal for users looking for a simple solution to building a new PC or upgrading there existing setup. Each component is selected from our range to offer a balance of value and performance and then tested and are assembled and tested by our technical team. This bundle is based upon the AMD FX QUAD Core Edition processor running with at a speed of 3.8GHz and 8GB of 1600MHz DDR3 Memory. These are installed and tested in the Gigabyte AMD 970 AM3+ ATX Motherboard, utilizing AMD 970 chipset with SATA 6Gb/s / USB3.0 / PCIe x16 slot, Gigabit LAN making it ideal for any mid range ATX system. Every bundle comes with a processor, heatsink/fan and memory pre-installed and is tested & setup by our technical team before being despatched from our warehouse. Please note: These motherboard bundles are assembled on demand to order and usually ship within 48hrs of the order being placed. During busy time periods these can increase upto 72 hours. PHOTO FOR IMAGE PURPOSES ONLY MEMORY MAY DIFFER FROM PICTURE.